As we cross the Turkish bridge from the city to the fortress, we look back to the left to see the city above the river a small bit of which is visible as the brown spot in lower right corner. At extreme left is part of the Armenian bastion and restaurant. 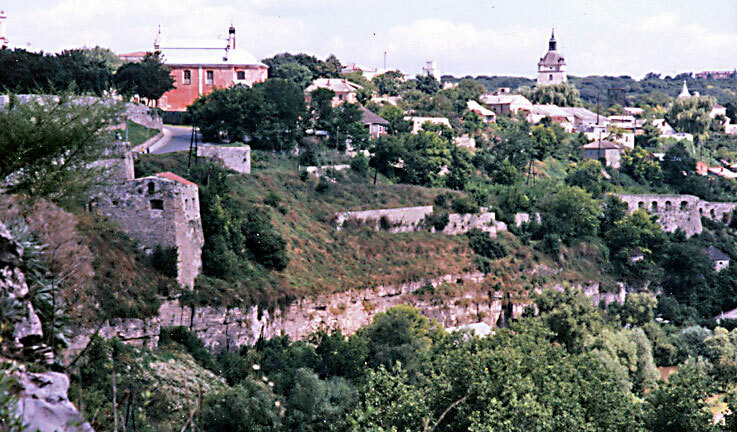 The red building beyond it is the Trinitarian Uniate Church, (number 17) we can see part of two defensive walls one behind the other extending along the ridge. The tall tower in the distance to the right is from the old Armenian church. (See plan.) View from 4 toward 7.